Despite falling behind in the second half on the road, the Edinboro women’s basketball team fought their way to a 79-66 victory over Gannon University on Saturday. The game helped the Lady Scots clinch a PSAC Tournament berth and a possible home game in the postseason. Off the tip, the Fighting Scots found themselves adjusting to the more aggressive playing style of the Golden Knights. Edinboro struggled from the floor, shooting 42 percent through the first quarter. By the end of the first quarter, the Fighting Scots trailed by eight. Things started looking up in the second quarter as Edinboro found themselves in the lead after a 10-0 run. The run was a collective effort from Michelle Jahn, Jontay Walton and Michaela Barnes. Coming out of the locker rooms and onto the court, it was clear that the Scots had a plan to extend their lead against Gannon, as they executed their defensive strategy. Contrary to the first half, the Scots played aggressive on defense while refusing to foul. This approach would force Gannon into eight turnovers while cutting their free throw points in half. 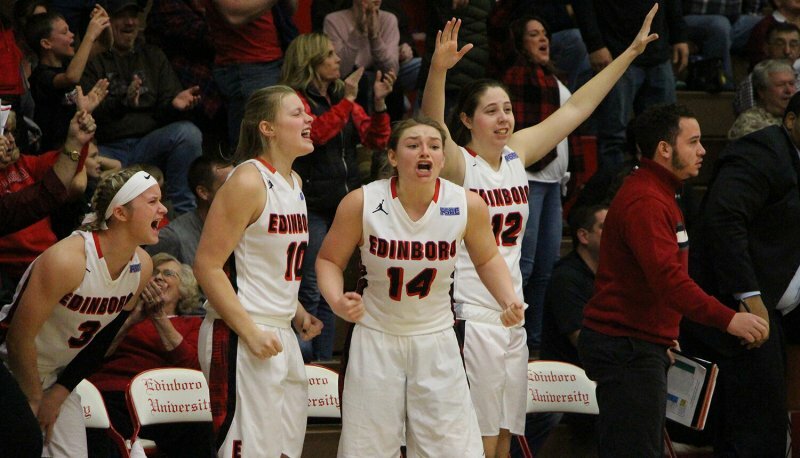 Edinboro capitalized on these turnovers, while remaining clean and consistent in their defense — the result being 14 points for the Lady Scots. Along with their strong defense, Edinboro’s win can also be attributed to their perfect free-throw percentage throughout the game (16-16). Gannon’s aggressiveness on defense ended up working out in Edinboro’s favor in the fourth quarter, as the Fighting Scots found themselves in the double bonus and used that aspect to help further their lead. The win at Gannon helped Edinboro to guarantee their spot in the PSAC tournament for the 10th year in a row. Head Coach Callie Wheeler, the assistant coach for last year’s PSAC champion team under Stan Swank, will look to capture the crown in her first season as a head coach. The Lady Scots now sit at 17-6 overall and 12-5 in the PSAC. Both the women’s and men’s basketball teams will face off against Clarion University Saturday, after traveling to Slippery Rock on Wednesday. Saturday’s games will feature an alumni weekend celebration.